Sometimes called cut-off saws, chop saws use circular blades to cut steel pipe, rebar, bar stock, conduit, and other metal stock. The cutting blade is attached to an arm that is pulled down to perform the cut. 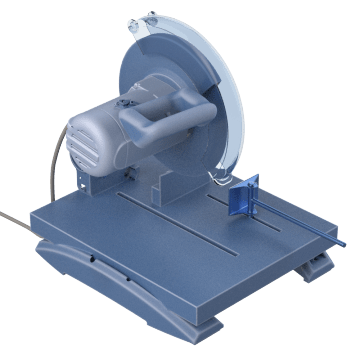 The saw is mounted on a base that stabilizes the tool and helps hold the workpiece, and a quick-adjusting clamp secures the workpiece to the base and allows it to be removed or repositioned easily. The tool has an adjustable fence for making angled cuts, and a spindle lock secures the blade and provides quick blade changes. These general purpose chop saws use abrasive cut-off wheels to cut solid and hollow-core metal rod and stock. Use these chop saws to make fast cuts in metal workpieces. 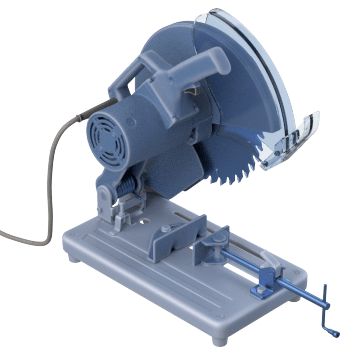 These saws operate at lower rotational speeds than general-use chop saws and use carbide-tipped metal-cutting blades, which last longer than the abrasive cutting wheels used on other chop saws. 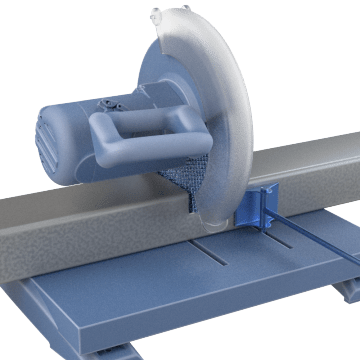 Unlike abrasive cutting wheels, the cutting blades used with these saws retain their original size as they wear, providing a consistent cutting capacity over the entire life of the blade.